Projector Screen, a New Jersey based audio visual re-seller, has now made their extensive database of screens available for sale online. The reseller launched their new e-commerce website this month. 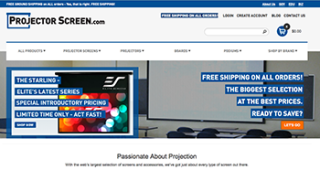 As an authorized dealer for the top projector screen brands including Draper, Elite Screens, Da-lite, Vutec and more, there over 48,000 projection screens and screen accessories available for sale on the new Projector Screen site. Said Gluck, “We really are passionate about projection here. We are not just selling 'boxes' like many of our competitors, we are selling solutions."